Agnews, Be Modern, Baines, Burley, Capital, Cast Tec, Crystal, Dimplex, Flavel, Focus, Gazco, GB Surrounds, Parkers, Robinson Willey, Smeg, Stovax, Taylor Made, Valor, Warm Home and many more. Conglomerate stone and marble gas fireplaces come in a range of colours and designs, so we are always able to find the one that will complement your room. Some of our fireplaces also come with under mantle down lighting. When you combine a micro marble backpanel and hearth with a stunning timber surround, the finished look will be unique to you, as there are many combinations to choose from. Timber surrounds are available in a variety of different designs or woods and we are also able to offer a made to measure service with many of our designs. If you have an existing cast iron fireplace and would prefer gas, whether natural gas or LPG (bottled gas), we are usually able to supply a made-to-size gas burner. 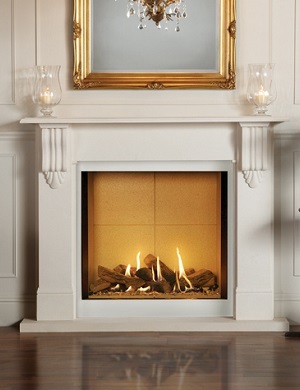 Modern ‘hole in the wall’ type fireplaces are also available in natural or LPG gas with many different sizes available. If you do not have a chimney, this is not a problem, as many of these fires are also available with a balanced flue. We are perfectly positioned in Ipswich, to cover a wide area, so what ever you are looking for, visit our showroom and we will be happy to advise you. Call us or drop in and someone will be pleased to help find the fireplace or fire you are looking for.